The Exposure Time Calculator (ETC) for the Binospec and Hectospec is available both on the web at this link and as a stand-alone application, which has been installed on the CF Linux cluster (version 1). Add set path = ( $path /data/oiropt/bin/ ) to your .myrc file to get all the TDC utilities, including the ETC. The ETC is also available for download to run on your own machine. It requires Python 2.7.X, and has been verified to work on a laptop runnning Mac OSX 10.9.5. Download the tar file here: ETC.tar.gz Unpack the contents, and edit the file RUNME to point to the location of python on your system. Then just execute it with ./RUNME. Click on the Plot Photons button. 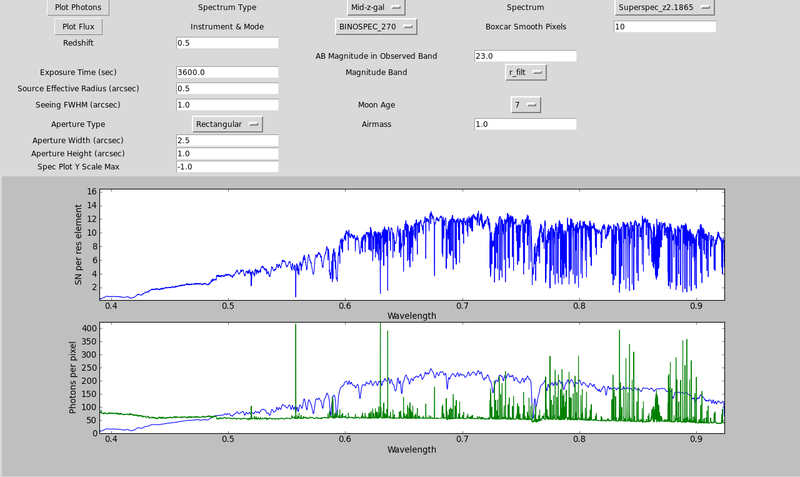 The resulting plots show (on top) the Signal to noise per resolution element for the observation; the bottom graph shows the counte per pixel of the input spectrum, and the square root of the counts in the sky background. The Plot Flux button currently shows the observed (sky + object) spectrum fluxed. Suggestions as to what could be more useful here are requested.